Why I wrote the Meditation…. I wrote the meditation SPREADING FRUITS OF LOVE to remind people… women, men, and children… that they can, at any time and any where, re-connect to the Divine Power & Beauty of the Life Force Creative Energy that runs through each and every one of US. When I first graduated from Chiropractic College I was blessed to go on a Mission Trip to Brazil, orchestrated by Dr. Lou Corleto. I knew if I was going to go on a mission trip, I was going to go with this man, this chiropractor, because Lou emitted pure LOVE and pure JOY. However, I was number three down on a waiting list for the trip. In absolute trust and faith, I gave it to the Universe to have me be there if I was meant to be there…and so it was! Many more magical moments and divine interventions occurred on that trip which I will leave for another time. However, what happened on the last night of the trip lead me to knowing my Soul purpose in being here on this planet and a quest, that continues, to enrich myself with a deeper understanding of how I can best fulfill my reason for being here. All of the chiropractors sat in a circle holding hands. My friend, Dr. Schuyler, was next to me, turned, looking with wide eyes, asking if I could feel the “pulse.” There was a wave pulsating around the circle through our hands. There was a quote that was read and I felt an immediate urge to find it, read it, understand where it came from, especially since it was “not” out of any chiropractic philosophy text, it was out of the book “Awakening to Zero Point” by Gregg Braden. Besides the pulse and the words, what I also took away from the circle, there was an image imprinted into my mind’s eye that conveyed the energetic purpose and the magnitude of our Mission. It wasn’t simply for these people living in Fortaleza, seated in the heart of Brazil, it was for the Heart of Humanity & the World. This pulse was creating a CIRCLE of LIGHT, a connection of Spirit, and of LOVE among us. As we left to return to our individual homes, it was as if we each were implanted with a “seed” of that Light. As we would continue to serve the people in each of our communities, we would sprout smaller circles of Light. Circles that would grow, as the people carried the Light out into their own lives, with their families and with their community. I saw these Circles of Light growing. They were growing and expanding such that they were beginning to interlace, merge and weave together, surrounding the world. It was a CIRCLE of LIGHT surrounding the world, pulsating, as a whole of LIGHT and LOVE. What came to me later was seeing the Light within each of us as an individual Stream, or River, coming down through each of our crowns and into our bodies. It felt that as we connected this Light from ABOVE and DOWN through our bodies and into the earth’s center, we would ground, anchor, root, and merge this Light from Spirit with the Life giving energy of the Earth. As I meditated on this image over time, it changed, moving upwards and INSIDE the body to expand OUT, like a cascade of Light around each of us and into the energetic field beyond. It reminded me of two very specific pieces of artwork by Alex Grey in Sacred Mirrors, the Spiritual-Energy-System and Universal-Mind-Lattice (http://alexgrey.com/art/paintings/sacred-mirrors/). It is the choices and the VIBRATION you continue to put forth every moment, into your thoughts, your words, your cells, your body, your healing, your health, your life, your relationships and ultimately the world that creates who we are inside and outside. So what are you choosing??? What are you vibrating??? 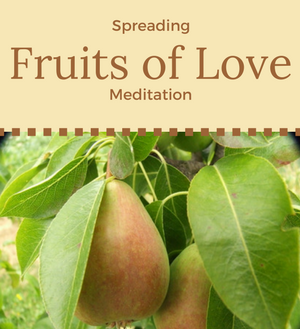 The Spreading Fruits of LOVE meditation is a way of PRACTICE for Mindful & Heartfelt re-alignment to the Divine, to Light, to Love, and to Joy every day and in what you wish to consciously co-create with the Universe. Certainly there are other practices which support keeping our vibration elevated. Your thoughts and words are only one of them. For me that resonates with my Soul’s purpose, whether it’s through my hands as a chiropractor, teacher of it’s philosophy or of creating healthy habits of living, my writing as a student of what Spirit teaches me directly, and how I am guided to share, one-on-one and collectively, with others…I am a Teacher of God, a teacher of LOVE. Ultimate Return and Re-Alignment to the Divine, to LIGHT, to LOVE, to JOY and to PEACE. May WE join together to re-create who we are individually, as well as collectively for re-creating the World. As each seed of LIGHT sprouts forth from within You, your Being, and from your Heart…may You and WE…create and SPREAD FRUITS OF LOVE for the Highest & the abSOULute Best for ALL…..Namaste…..I bow to the LIGHT in you!